The genesis for this project starts like any great Idea. A couple of blokes meeting up for a sun soaked beer at their local haunt, Sandbar in Surfers Paradise. As I rolled up on my 1981 GS550, I was greeted by a couple of mates, Jake Short and Rich Edmiston who didn’t waste any time on throwing an idea my way. 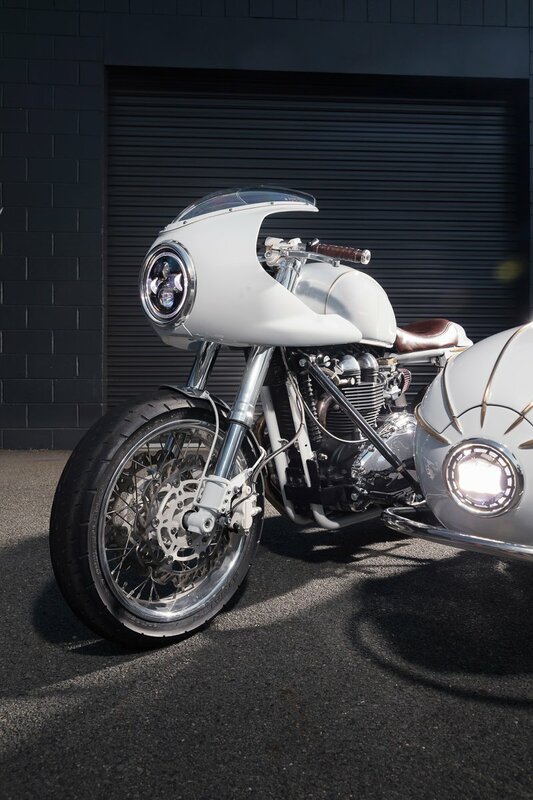 An all-out custom motorcycle and sidecar built to serve our coastal community delicious Vittoria Cold Brew Coffee – project title – the Cold Brew Café Racer. The Short family has owned and run Sandbar for 20 years and the project would take shape to give back to the community. 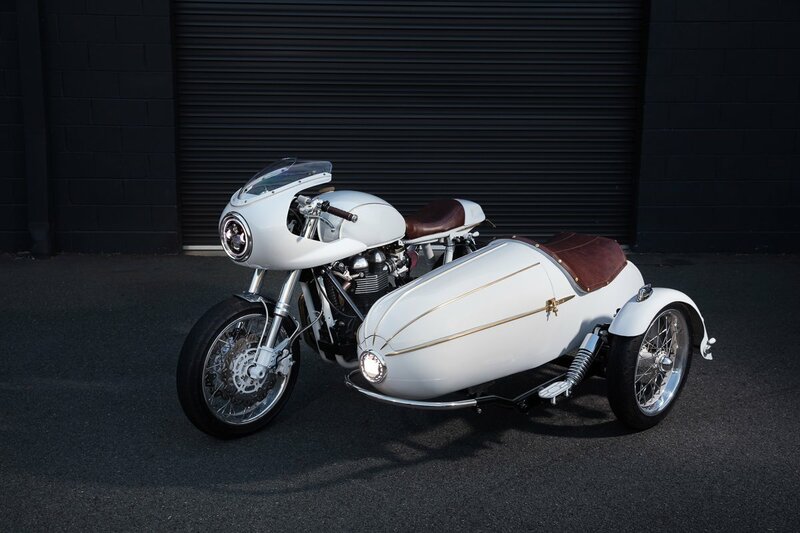 Alongside this bike being a great piece of eye candy with an impeccably styled sidecar, it was to be a creative collaboration between myself, Vittoria Coffee and Sandbar who both funded the build. 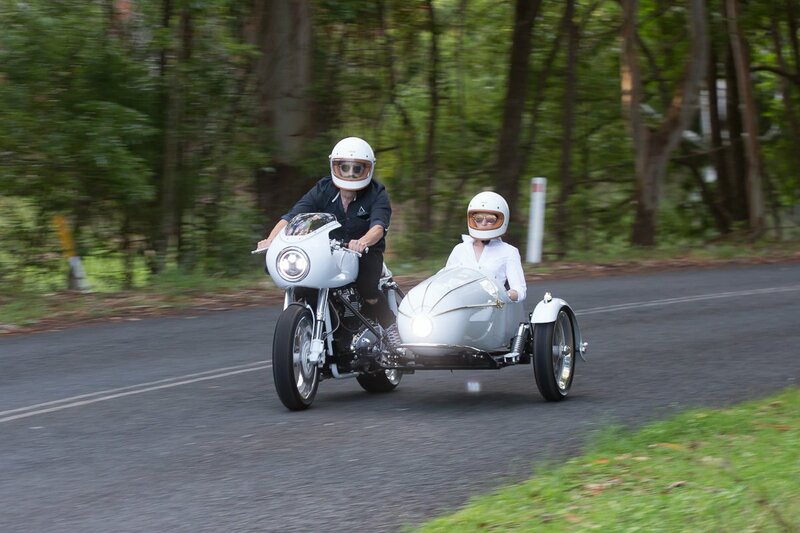 As all motorcycles should, it had to perform with and without the sidecar as when it’s not delivering a morning boost to Gold Coast residents out walking their trophy dogs, it had to handle a fast paced Sunday afternoon sprint over the mountains to give it a good run. If you want a video run through, make sure you check out the YouTube Clip at the end of this blog! 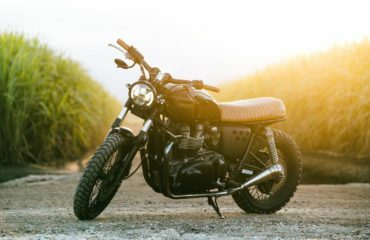 The donor for the project would be a 2009 Triumph Scrambler with a Cozy sidecar attached. 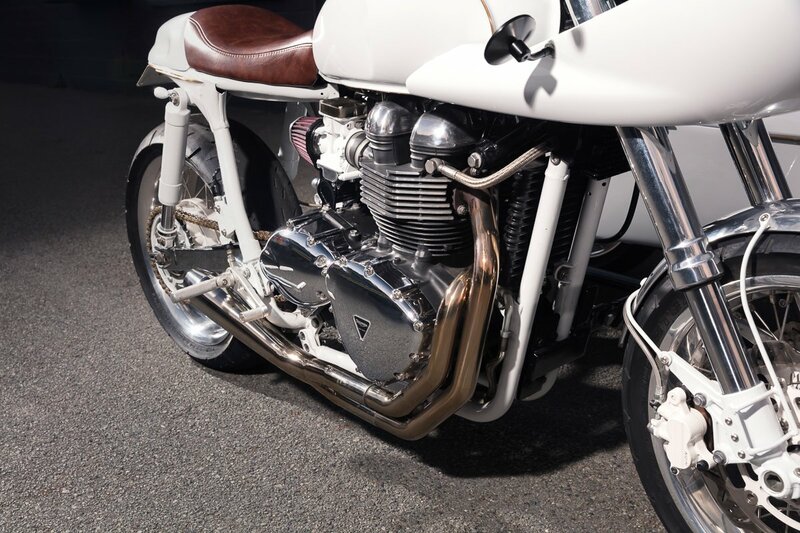 I was glad to build something different with a Triumph; they’re such a staple for custom builders and with a sea of bolt-on parts available, it’s easy to blend into the crowd when building one. I wanted a timeless look that never grows old a bit like a vintage Rolex. While I set to work on the bike, the sidecar body was sent to a mate for some body work but I’ll come back to this later. First things on the list for the Triumph were the brakes and suspension. The Scrambler received 54mm polished USD forks, twin disc brakes and a custom triple clamp. The forks were lowered 40mm and rebuilt to suit the ride height with sidecar attached. The rear suspension was treated to a set of all new K-tech Bullit shocks, a spring less system that offers an incredible ride. I was a little apprehensive on this one but the product over delivered and presents a really tidy finish. With the suspension set, the wheels were the next big ticket item being specially machined alloy soft lip rims = 17” x 3.5” front, 17” x 5.50” rear. I received the wheels, hand polished them and laced them up to the existing hubs. The massive rear wheel was wrapped in the Shinko Stealth 003 and is a huge standout on the bike because you just don’t see Triumphs with 190 rear tyres like this emphasised by the super-tight clearances now held by the swing arm and chain. It’s so damn tight but with the sprocket offsets, it all works a treat. Next, the tail and seat combo had to compliment the wide rear so I set to work on a short hooped tail with a flowing tail cowl and vertically integrated tail/brake light. The shaping and fabrication done, I wanted that little something extra to truly set the bike off. The colour scheme was to be white with metallic highlights. I decided to integrate select brass components into the design – but you have to be careful – it’s easy to go overboard with such details and I was conscious not to fall into that embellishment trap. A classic styling case of “less is more”. I’d seen a lot of chopper builders using moulded details on their bikes using round or flat bar to add a 3 dimensional aspect to the tank design. 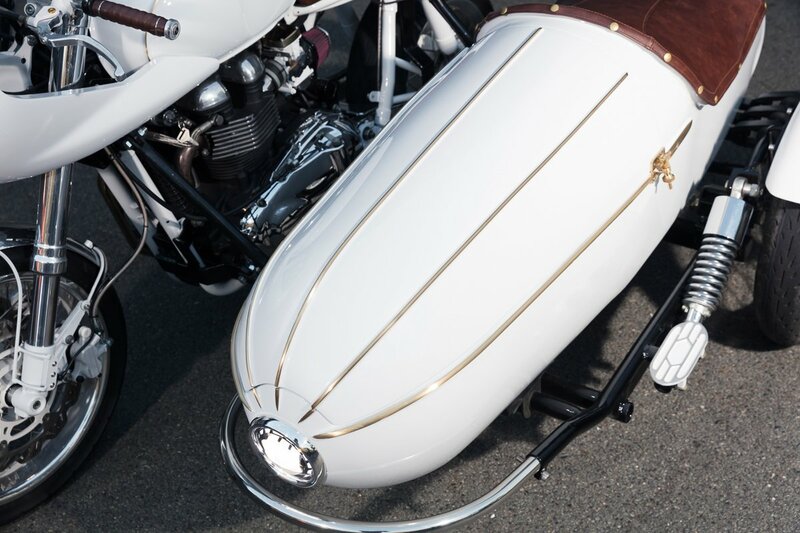 I liked the concept so adapted it to this café racer design with 6mm solid brass rod hand shaped and welded to the tank and tail sections with the fibreglass front cowl rods applied with epoxy. Tig welding brass to mild steel wasn’t the easiest feat but with a few runs and stuff-ups, I soon got the hang of it. The other complementary brass detailing came in the form of custom-turned EFI choke and idle controls, EFI caps and a billet brass fuel cap. The bones of this bike were starting to come together and giving my vision of the bike legs. 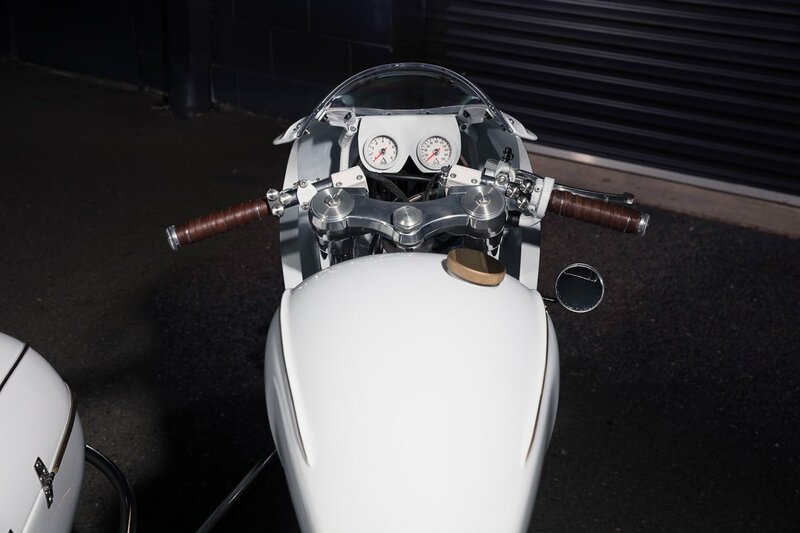 The final piece to finish off the silhouette was the front cowl being a 2017 Thruxton piece modified to fit the front end and house the custom PBM Speedhut gauges. Nestled neatly at the very front of the cowl, the speedo and tach create a seamless look over the custom top triple clamp. The clip on bars were finished with new levers and minimalist Purpose Built Moto button switches controlled by our compact Black Box module. Another detail closed out around this time was the rearset function. I’d seen a lot of rearsets on these bikes that include an arm allowing the rear brake master to stay in its factory position – too easy. But when hollowing out the frame, I found out the brake master is way up under the right side cover. Anyway, with the Tarrozzi rearsets mounted, the master was repositioned and neatly located directly above the right foot brake eliminating the need for excessively clunky linkages. Just before the bike was to be stripped to pieces, I needed to build an exhaust, and if you follow my social media, you’ll have noticed that I’ve been dabbling in building my own headers for a little while now; only single cylinder stuff up to this point but I was determined to craft this one fully in-house. The chosen route wasn’t the easiest but where’s the fun in that? I decided on a single sided 2-1 design with the collector placed just before the muffler so the vertically stacked headers would be routed to visually frame the triangular stator covers making the hand polished exhaust system a definitive stand out on the bike. When you hear it fire up in the video below you’ll see why we all love it so much! When a bike is stripped and out having supplier work done, I tend to get my affairs in order in regards to finishing touches and any final parts that need to be ordered. Like all builds, it was time to contact my mates at DNA Performance Filters. Marios and I always speak about current projects and I feel he could sense my particular excitement about this one. After our chat he said, “send me the dimensions of what you need and I’ll make something special for you”. I love surprises so I did as I was told and within a couple of weeks I had a one- off set of custom pod filters laser etched with a PBM logo; “No f*n way”! was my first reaction. Paired with the colour matched EFI body, brass caps and polished bowl (albeit a fake one) they look incredible. Most importantly, when on the tuning bench at Dynomite Moto they opened this torquey Triumph motor up nicely. 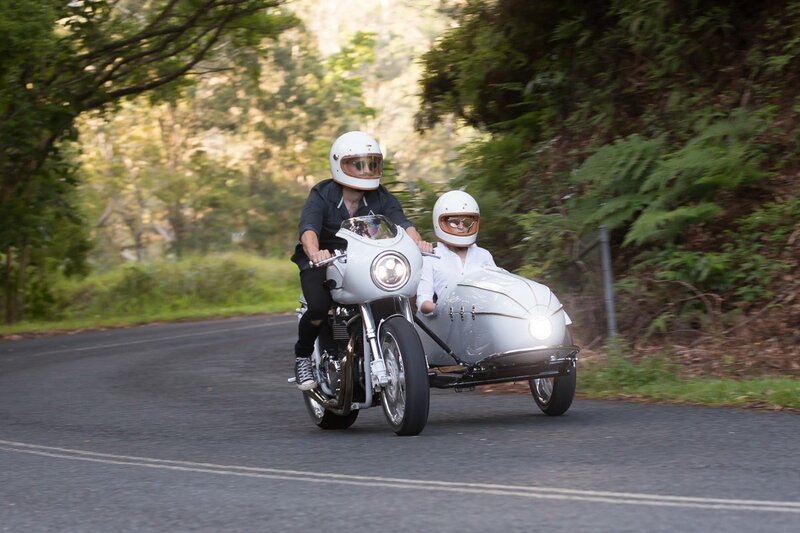 The motorcycle itself was delivered prior to the sidecar being finished and after a few test rides, Jake was given the bike for a thorough shakedown with its maiden voyage being on the 2018 Gold Coast Distinguished Gentleman’s Ride. While he was out testing the bike, I was in the shop tinkering away on what was to become a servery styled sidecar. 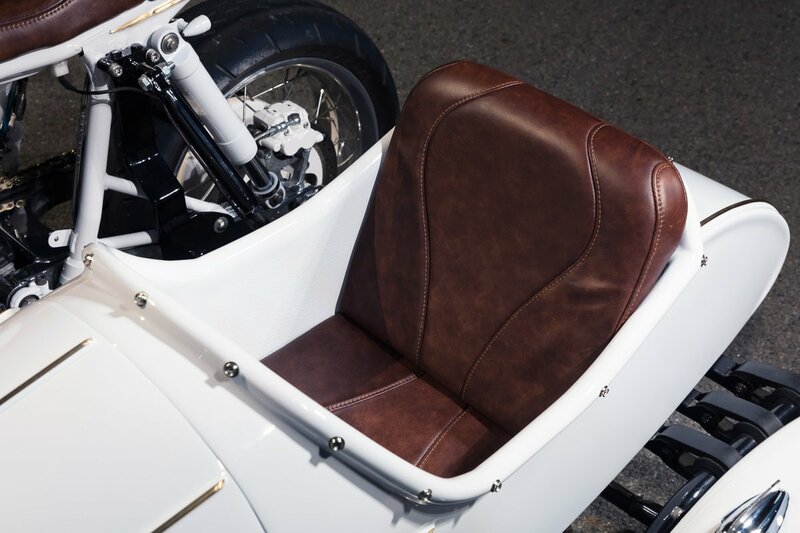 The personnel opening on the sidecar was pushed back 400mm to achieve a fast bullet shape to the chair. All of the factory trimming was removed and the body cut open, braced and hinged. This allowed room for a cooler to be built into the front to serve bottles of Vittoria Cold Brew Coffee out of and also a chair with the cooler removed. With the metal work done, the body was sent out to have the cooler custom built by a local fibreglass specialist. Whilst out, I began worked on the chassis. At initial glance, the original fixed fender seems to sit a mile off the wheel allowing it to travel inside as the suspension operates – not good enough for this project. The old guard was cut up and generously trimmed down with new mounts fabricated so the fender can travel with the wheel and hug it tightly for a cleaner look. During body modifications I recessed a PBM 4.5“ LED headlight and it was time to now sort the tail lights out. Fabricated to mount directly off the fender is a twin stack of prototype PBM Orbit Mini LED brake lights with hidden wiring striking a balance between old world charm and modern functionality. Before paint it was time to style the sidecar in the same direction as the bike so I set about fixing solid brass rods to the body creating one conducive design statement. Slowly annealing the brass, hand shaping it to conform to the body, moulding it and finally fixing it down. It’s a painstaking process done by eye and hand, but a hugely rewarding outcome when you stand back and admire a concept you’ve turned into reality. When it came to the upholstery Jamason and I held “elegant simplicity” as the key due to the bike being a bold vision as it was. 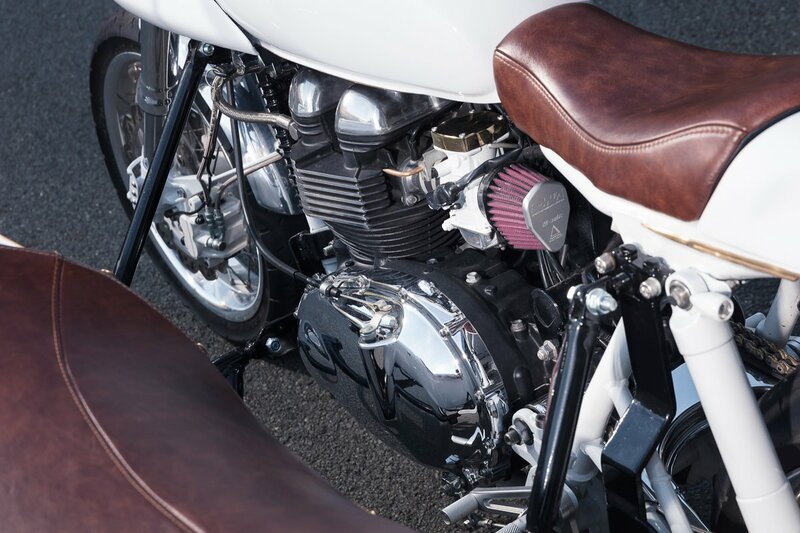 Simple and amazingly executed, the vintaged coffee brown leather and stitching compliment the classic feel of the build allowing it to do all of the style talk. 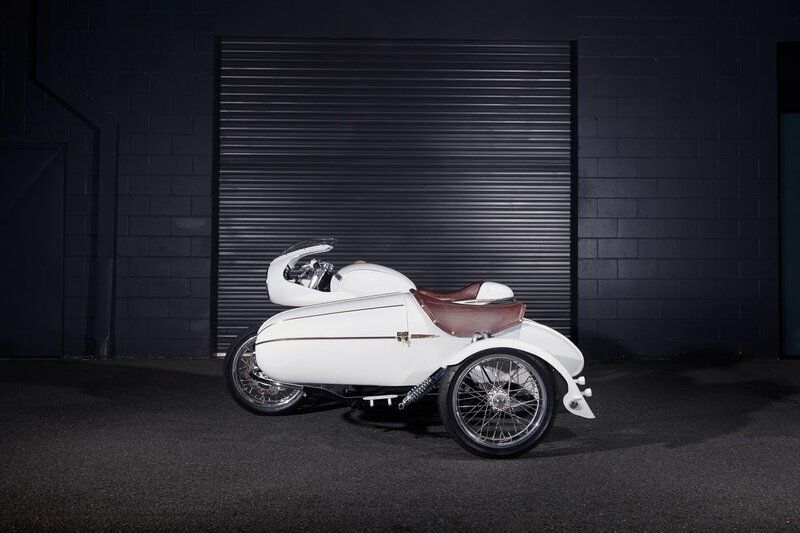 The final piece of the puzzle was the intricate sidecar alignment and having read through a few manuals on geometry and functionality, I figured I needed some niche advice by those who had done it before me to get it right; they didn’t disappoint. The answer was to set up some straight edges and calculate three key running factors – the tow in, lean out and axle lead. It took me a few rounds of fine tuning but eventually I’d created a Cold Brew Café Racer that’s easy to ride with plenty of performance under throttle and a crackling deep note. 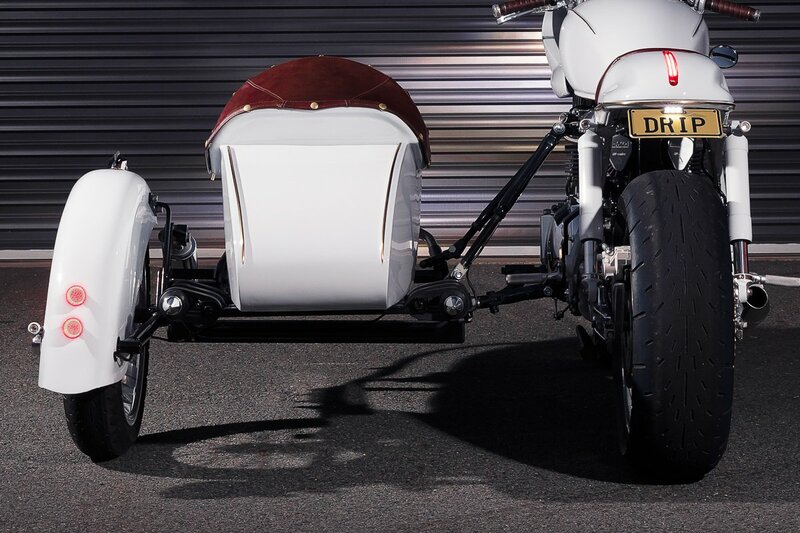 Slipping on the Hedon Herione Racer and heading out on the bike without the sidecar is an ultimate experience to enjoy. 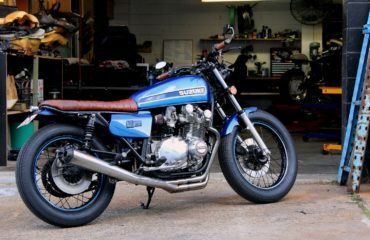 The suspension mods, fat rubber, dyno tuning, bellowing 2-1 exhaust and racer-like rider position all combine to create a single seat café racer that’ll smash bugs on your visor at speed; the power curve begging to be tested from top to bottom. Due to the quite weighty sidecar mounts, the bike alone isn’t the nimblest performer but that’s not to say you can’t have the time of your life leaning into some nice mountain corners with torquey power on tap at a slight twist of the wrist. It’s easy to see why these bikes are just so damn popular worldwide and I’m stoked to have had the chance to build this project for two clients that dared to innovate through the local industry of custom bike building. 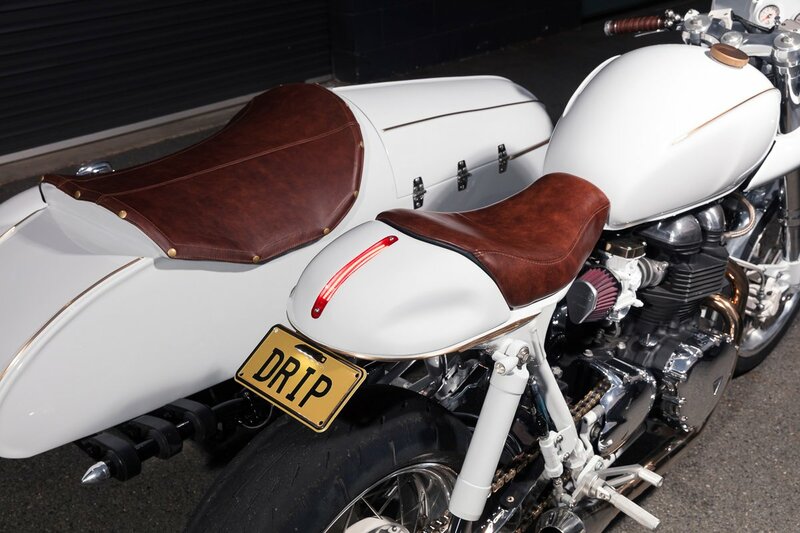 The Cafe Racer Sidecar outfit will take pride of Place on the Surfers paradise esplanade outside Sandbar. Serving up Vittoria Cold Brew Coffee to the masses from what will undoubtedbly become known as the legendary Cold Brew Café Racer. My purpose throughout this endeavor has been delivering the build experience to those who otherwise may not have ever had the chance. 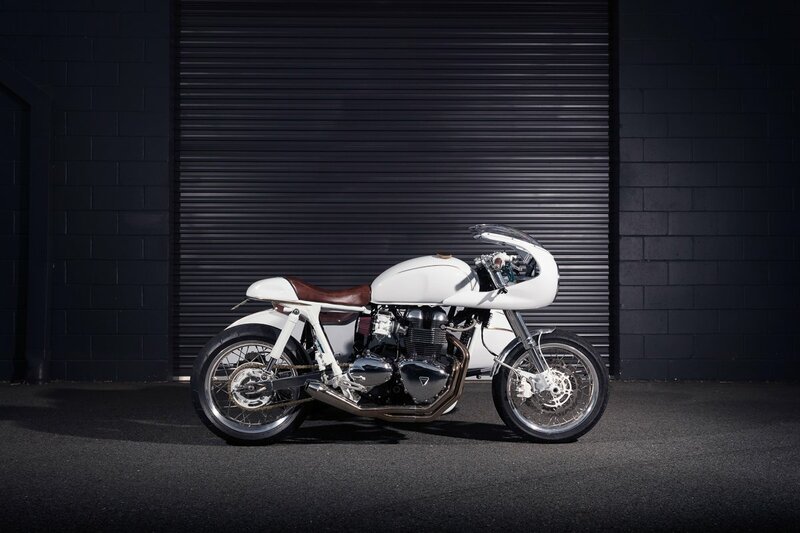 Taking an inclusive approach with your custom motorcycle project and focusing on making you a part of the experience. 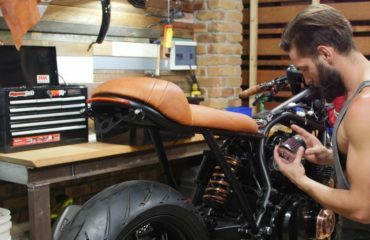 In parallel to this I also pour my energy into the manufacture of high quality, detail oriented and above all easy to install components for your motorcycle project.